Simple pasta dish that is ready in about 10 minutes. 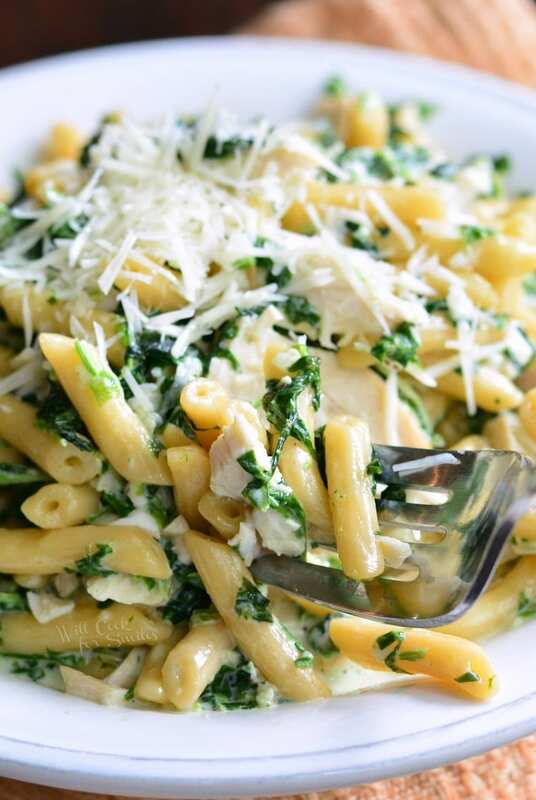 This delicious, creamy chicken pasta dish is made with spinach and garlic Alfredo sauce, tender rotisserie chicken, and quick and easy pasta. You know what I miss? Well, a few things actually. I miss laying down on my stomach, I miss seeing the bottom half of me without having to look in the mirror, I miss wine, I miss sushi, I miss having energy to run around all day, and I actually miss being able to spend as much time as I need in the kitchen preparing anything I want. I’ve had no energy whatsoever lately and moving around has become quite a task. If I drop something…it says there, unless little man or hubs are kind enough to pick it up for me. Forget about reaching on top shelves for anything. I have to get a step stool even to reach the second shelf of the cabinet because my giant stomach is in the way, all…the…time! She is getting heavier by the day and it seems like she’s set up camp for a while. She may still have a couple of weeks before her due date but I am quite ready for her to make her way out. With my little man, I didn’t make it this far in the pregnancy because he decided to be early, so I’ve never experienced the 9th month. Now I understand why everyone told me that the last month is the hardest. It is literally the heaviest and most uncomfortable time of my life. Oh, and the HUNGRIEST! I am hungry ALL THE TIME! My other two alligators’ appetites have not changed but now, there are three alligators that are always hungry. 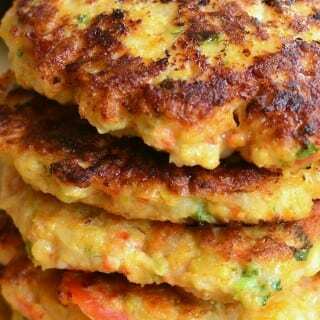 So with three hungry mouths to feed and not having the energy to stand and cook for more than 30 minutes at a time, I am all about EASY recipes these days. I have a feeling that after little miss comes, I will still be a fan of quick and easy recipes because I will have my hands full. Barilla recently came out with a new product and I swear, they did it just for me. How sweet of them! There is a new pasta product from Barilla and it’s Barilla Ready Pasta. WHAAAT?! Yes, I said “ready pasta.” This pasta comes al dente and is ready in 60 seconds. 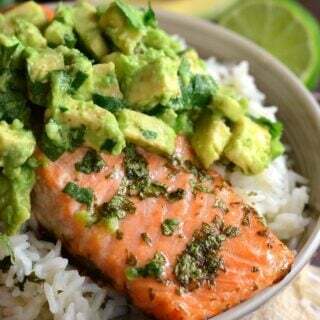 No need for boiling water or draining, all that’s needed is a microwave. 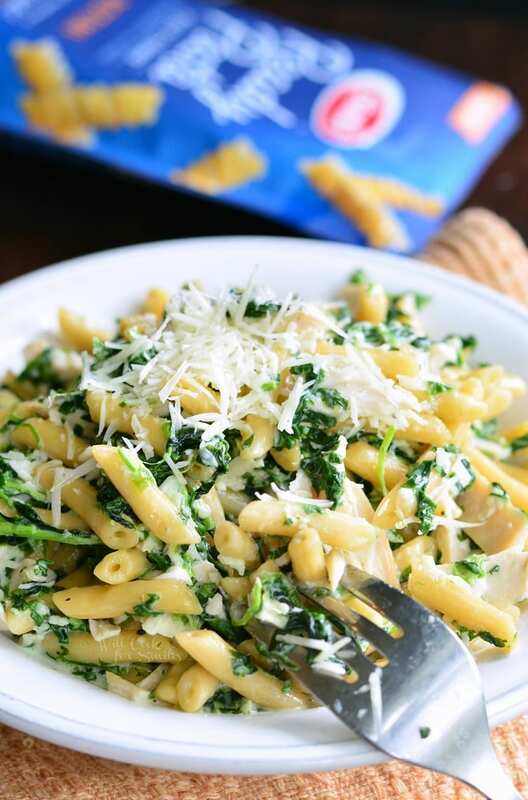 This Barilla Pasta is also made with just 3 simple ingredients – Barilla pasta, extra virgin olive oil, and a pinch of sea salt. 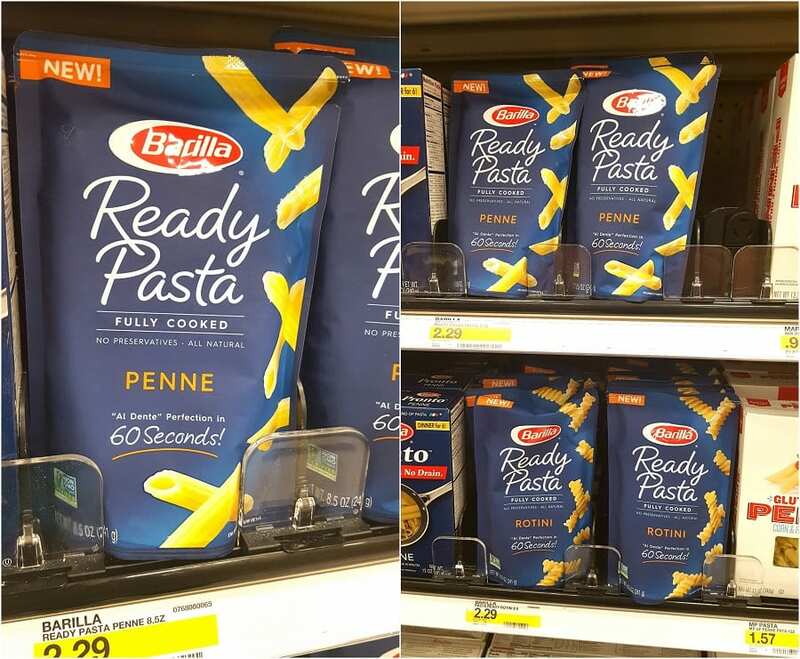 Make sure to pick up your own pack (or three) of this Barilla Ready Pasta at your Super Target next time you shop! Don’t forget to check your Cartwheel app for a 10% off offer until 9/14/2017. 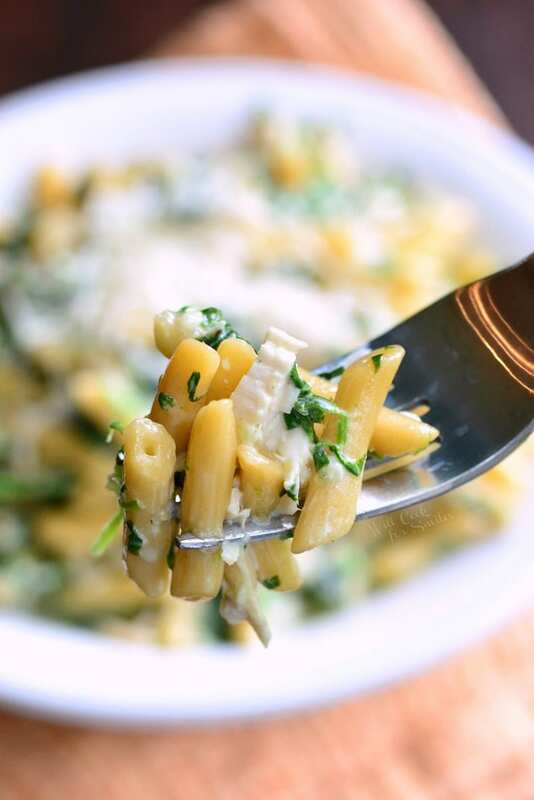 There are a ton of fast and easy ways to prepare this ready pasta. First time I got it, my instinct was to make my family’s favorite Alfredo. 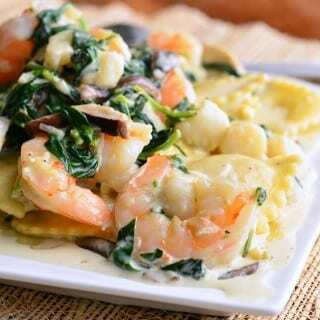 I did a little healthier take on Alfredo by loading it with spinach and garlic and omitting butter. 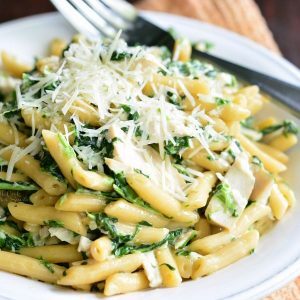 I was so happy that even though this pasta dish was loaded with spinach, my husband ate everything and nearly licked the plate. 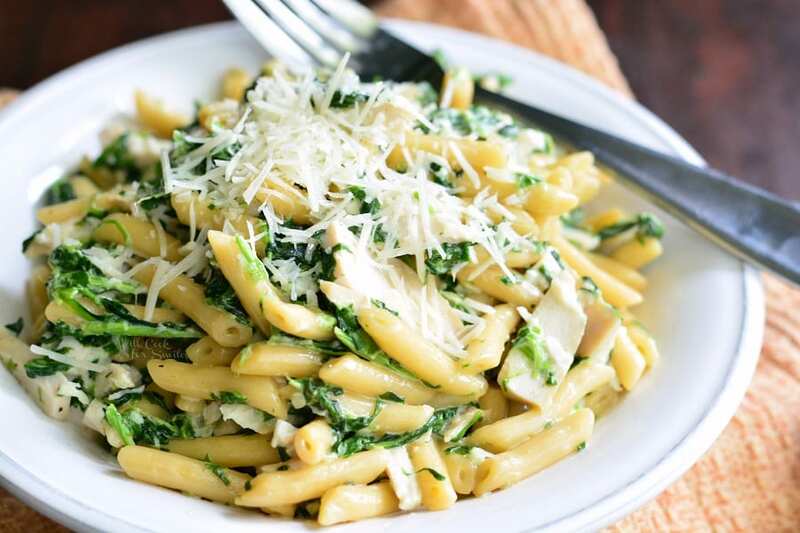 This delicious, creamy chicken pasta dish is made with spinach and garlic Alfredo sauce, tender rotisserie chicken, and quick and easy pasta. Prepare Barilla Ready Pasta according to the package instructions. In a sauce pot, heat up oil over medium heat. Add pressed garlic and sauté until fragrant. 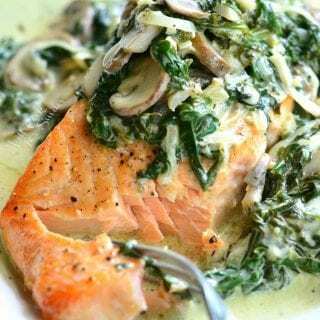 Add spinach and sauté for a couple of minutes. Add heavy whipping cream and stir. Heat through (don't boil) and add dry Parmesan cheese, salt, and pepper. Cook for a couple more minutes. Slice chicken and add it to the sauce. Add pasta and mix everything well. 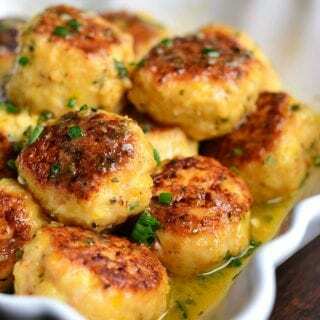 Optional: you can add some more Parmesan cheese on top as serving. 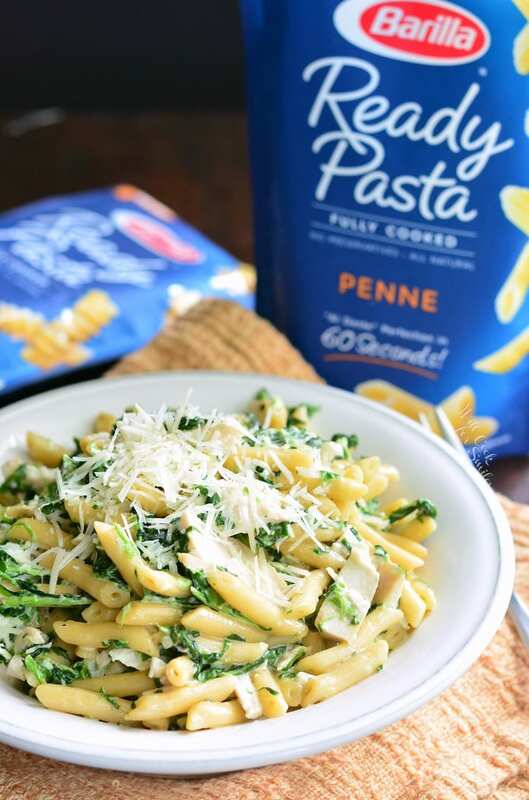 To find some more delicious recipe ideas for Barilla Ready Pasta, make sure to visit their Pinterest, Twitter, Facebook, and Instagram. 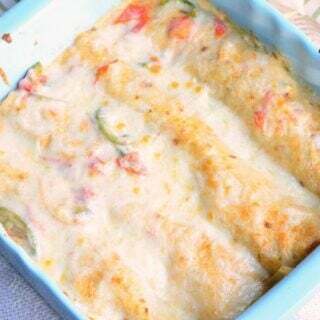 Don’t miss this quick “How-To” VIDEO from Barilla. Thank you so much, Sam! It means a lot. 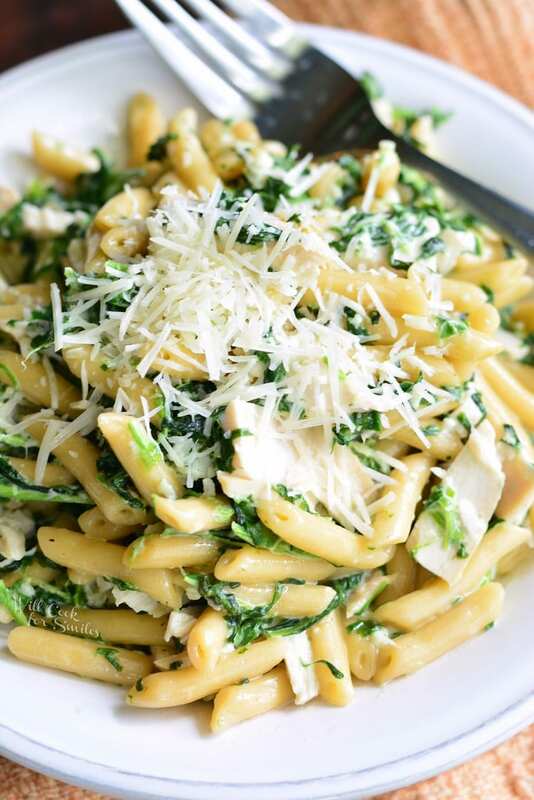 Delicious, creamy chicken pasta dish ! Look amazing!! I’ll be cooking his tonight!! Thank you! I really hope you enjoyed it! I made it, it was too heavy, sickly and rich and bland and left a metallic taste in my mouth. the spinach didn’t suit the dish nor did that type of cheese. Cheddar would have been better and no spinach or mushrooms instead. wouldn’t use your recipe again.